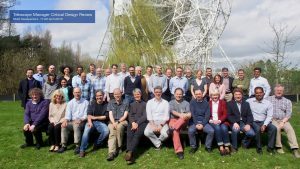 SKA Global Headquarters, 6 August 2018 – After four and a half years, the international Telescope Manager (TM) consortium has formally concluded its work on the architectural design of a fundamental part of the software for the Square Kilometre Array: the nervous system of the Observatory, which is called the Telescope Manager. Formed in November 2013, the consortium was tasked with designing the crucial software that will control, monitor and operate the SKA telescopes. TM brought expertise in the field of Monitoring and Control for large-scale, complex systems and design of user interface experience. The TM work was part of a global effort by 12 international engineering consortia representing 500 engineers and scientists in 20 countries. Nine of the consortia focus on a component of the telescope, each critical to the overall success of the project, while three others focus on developing advanced instrumentation for the telescope. After four years of intense design work, the nine consortia are having their Critical Design Reviews or CDRs. In this final stage, the proposed design must meet the project’s tough engineering requirements to be approved, so that a construction proposal for the telescope can be developed. Following their successful CDR in April 2018, the TM consortium set about making the final adjustments to their proposed design which they have now completed. While the consortium now formally ceases to exist, the SKA Organisation continues to work with NCRA and the other former consortium members on the System Critical Design Review development and the SKA construction proposal, where their expertise will be required to make sure the TM design works alongside the other elements. *Consortium members included the Commonwealth Scientific and Industrial Research Council (CSIRO) in Australia, the National Research Council of Canada (NRC), TCS Research and Innovation and Persistent Systems in India, Italy’s National Institute for Astrophysics (INAF), Portugal’s ENGAGE SKA Consortium through Instituto de Telecomunicações (IT) & the School of Sciences of Porto University, the South African Radio Astronomy Observatory (SARAO), and the UK’s Astronomy Technology Centre funded by the Science and Technology Facilities Council (STFC). Find out more about TM’s work, including photos and videos. The Square Kilometre Array (SKA) project is an international effort to build the world’s largest radio telescope, led by the SKA Organisation based at the Jodrell Bank Observatory near Manchester, UK. The SKA will conduct transformational science to improve our understanding of the Universe and the laws of fundamental physics, monitoring the sky in unprecedented detail and mapping it hundreds of times faster than any current facility. The SKA is not a single telescope, but a collection of telescopes, called an array, to be spread over long distances. The SKA will be constructed in Australia and South Africa; with a later expansion in both countries and into other African countries. Already supported by 12 countries – Australia, Canada, China, France, India, Italy, the Netherlands, New Zealand, South Africa, Spain, Sweden and the United Kingdom – the SKA Organisation has brought together some of the world’s finest scientists, engineers and policy makers and more than 100 companies and research institutions in the design and development of the telescope. The National Centre for Radio Astrophysics (NCRA) of the Tata Institute of Fundamental Research (TIFR), Pune, is one of the premier astronomy research centres in India. It is also the nodal agency for the Indian participation in the SKA. NCRA is responsible for the construction and operation of the Giant Metrewave Radio Telescope (GMRT) which is the largest radio telescope in the world at metrewavelengths. Recently the GMRT has gone through a major upgrade which included many technical improvements, thus enabling astronomers to study numerous cutting-edge scientific research problems. GMRT is already serving as a test-bed for carrying out observations with the SKA and hence has been accorded the status of a “SKA Pathfinder”.